I installed the graphhopper addon as well as the routing date form the link. In online Mode it works well, but in offline Mode not. When clicking on the routing icon I do not receive the pop up. 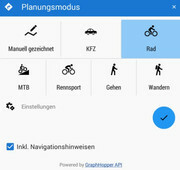 Clicking on the blue circle at the left bottom (in this case a bicycle, when I select in the online mode car, there will be a car) I receive only a popup "manually drawing". The routing itself will be calculated point--to-point. I installed the last add-on and the just publishedrouting details in mapvector. When start routing I cannot change between bike, hike car etc. I have to go to online routing for selection. Back to offline routing I only receive as result a straight poit to point routing a route is not calculated. [DE] - deutschsprachiger Forumsbereich / Re: Tracks importiert, diese mal ausblenden? Danke Wolfgang das suche ich schon lange. Ich blende die Tracks gerne in der Planung ein und aus. 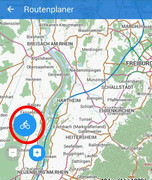 I published locus action files to simplify routing data installing and updating — https://graphhopper.develar.org As for openandromaps, now you can simply click "Locus" link to install or update. when downloading d.ch-at I receive always a fault report as per enclosed screen-shot. I have tried on two separate tablets and with different Internet connections. I tried with several ZIP files, packing them on PC and Tablet, import with GPX will show the tracks twicce. Finally I converted to kml and zipped them and it worked fine. I am looking for the possibility to import many tracks in GPX format at one. I tried to mark all in a folder, but I cant see a respective button. Then II tried it with a zip file, but the tracks are imported twice. habe nach vielem Versuchen, Locus neu installiert, und beim Start den Ordner auf extSDcar/Locus gesetzt. auf der SD-Karte habe ich ziemlich viele Karten gesammelt. Locus initialisiert die dann alle. Kann ich irgendwo einstellen, dass nur die Karten im Ordner "Locus" initialisiert werden und nicht alle auf der SD-Karte. Habe einige in einen eigenen Ordner verschoben, der wird aber auch gelesen. Gerade im Urlaub möchte ich nur die Karten der jeweiligen Region. [DE] - deutschsprachiger Forumsbereich / Locus hängt sich beim Start auf. Ich habe mir einen Teil der Wanderreitkarte heruntergeladen. Nach erscheinen des Bildschirms Bearbeitung läuft" wurde bis zu dieser Karte gelesen und dann war Schluss. Ich habe die Karte dann mal aus dem maps Verzeichnis genommen aber Locus sucht die Karte immer noch und hängt. Gibt es eine Möglichkeit da einzugreifen.